While prepping the salad I will throw the flatbread on the grill. It is great with the chimichurri as well. Heat your grill to medium high heat. Combine the flour with the chopped parsley. Smash the garlic and sprinkle the salt over it. Using the flat part of the blade scrape the garlic and salt until it becomes a paste. Add it to the flour. Melt the butter and add to the flour along with the buttermilk. Mix by hand until it forms a smooth ball. Cover and allow the dough to rest for 10 minutes. Divide the dough into 4 pieces and roll on a floured cutting board into a 10” round. Brush both sides with Olive Oil. 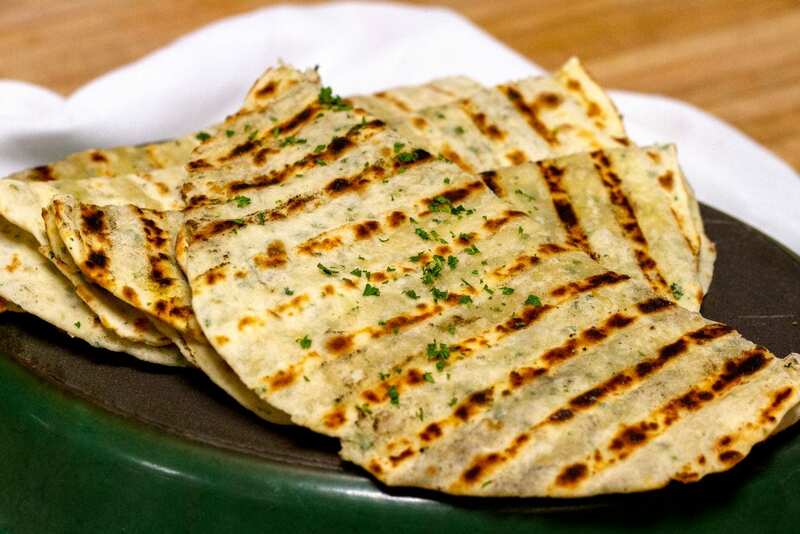 Place each flatbread on the grill and allow to cook about 1 minute per side. You should have nice grill marks on each side. Remove Flatbread from grill and keep warm on a plate covered with a towel until service.